Quote Reply Topic: Ellipses with Degree? What is meant by ellipses with degree (please see below image for more detail) and how do you draw it? Hello dery, please find an example of ellipses with degree. In fact an ellipse is a circle that you look on its side with a certain angle ( degree ). If you have an angle of 0° you will only see a line, if you have an angle of 90° you will see the circle. I hope this will be self explanatory because I'm at home without AutoCAD. Dery, what you see on the picture are old drawing plastic parts to be used on the drawing board. If you want to draw your examples you can do it in 3D or draw a circle and do some "angled projection". dery wrote: What is meant by ellipses with degree (please see below image for more detail) and how do you draw it? And the next step is your AutoCAD drawing 2D or 3D + flatten. Kent COOPER, I have uploaded the AutoCAD file : ELLIPSES WITH DEGREE.dwg in the CAD/BIM Blocks library because I'm trying to draw the cubes and the ellipses. For the ellipses your methods looks appropriate to the case but I'm not abble to draw the cubes in 2D ( dimensions x , y , z in relation with the angles defined in the 3 figures ). Can you help ? Figure 11.47 . Angle size determines viewpoint of object but it doesn't work vith the command viewpoint. Dery have you fixed your drawing problem because not me. Obviously the 10-degrees-up-on-one-side and 40-degrees-up-on-the-other in the original left-most image don't mean the same thing as the "From the X Axis" and "From the XY Plane" angles in your VPOINT dialog box images. I'm not sure how to translate between them, but it certainly would involve some potentially complex trigonometry. That turns out to be the case -- the true "rotation" or "degree" of the Ellipse on the left face of the left-most image [with the base-side angled up at 10 degrees], that they show as 55 degrees, would in reality be a hair over 57 degrees. Likewise the one on the top face of their middle image. Hello Kent, thanks for the effort to explain this for me and Dery. Unfortunately I'm not enough good at maths for you and from all the years that I did use informatics I know, because I have used the drawing board and then the computer and again the drawing board, etc... again till 1995 the beginning of the "all computer era" for me that when you use a computer you loose the ability of "thinking" or at least how to use a hand calulator. I would be interesting to realize it "directly" in 2D and this will only be possible if I can drawn these cubes in 2D and then try and draw these ellipses with degrees that wil have to touch the sides of the 2D cubes. 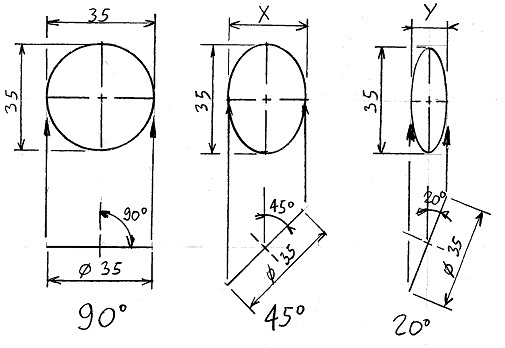 I know how to draw "by hand" 2D or 3D" automaticaly with the computer" isometric views but not these 3D "special point of views", can you help me ( and Dery if he still want )? I'm not sure how to get a 3D view to be from the right direction that Flattening it will result in the desired base-edge angles, either. If I think of something, I'll write back. Make an Ellipse using the corners of the rhombus for the axis endpoints [the dashed-line larger green one], put a Line across the middle of the face [yellow], and SCALE the Ellipse down, about its CENter, using the Reference option with the two magenta points as the Reference distance [MIDpoint and APParent-intersection], and the end of the yellow Line as the new distance. Either of those Ellipses will give you its axis aspect ratio in the (assoc 40) entry in its entity data -- the real rotation of it is the angle whose sine is that number [included in the next image]. That image also shows one way of easily making the other two sides, also as rhombi, as a true isometric version would be, making their Ellipses equally easy to draw in the same way [blue]. BUT in the original image, the Ellipses on the top faces of the cubes all have their major axis horizontal, which the above does not. For that, the desired degree of rotation of the Ellipse affects the edge dimension along the 40-degree sides. Determining that involves drawing an Ellipse with its major axis horizontal, and the desired rotation, Rotating copies of that appropriately so that drawing bounding boxes around them [the dashed grey below -- I have a routine to do that] and Rotating those back gives edges parallel to the "cube" edges, then some Moving and Scaling [with Reference option] to get them in the right positions and sizes, and the far-side cube edges in the right places. I'll upload the CAD file that both these images came from -- same place and same file name with -2 added at the end.